The story of how Earth discovered an advanced human alien life being hunted by an unstoppable dark force has been brought to life in a new scifi audiobook by SciFi Publishing. Moon Wreck: The Slaver Wars, Book 1 is in the Amazon Best Sellers Rank Top 100 for Space Opera and First Contact genres. 5.0 out of 5 stars “Awesome start!" 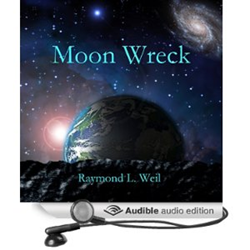 Raymond L. Weil is an avid reader and have a science fiction / fantasy collection of over two thousand paperbacks. He wants future generations to know the experience of reading a good book as he has over the last forty years. He lives in Clinton Oklahoma with his wife of 40 years and their cat. Sci-Fi Publishing enables authors to bring their work to life, creating powerful audiobooks for Sci-Fi fans. We partner with authors from audiobook production to marketing so they can continue to focus on their passion, creating new and amazing worlds. For more information about us and to discover other great scifi audiobooks, visit us at either http://www.scifi-publishing.com or http://www.scifi-audiobooks.com.